There is no way that you would miss a broken window around your property but disaster shouldn’t strike before you take notice of your windows. They might not appear to be more than a few panes of glass, but your windows play a huge part in keeping your property functional. 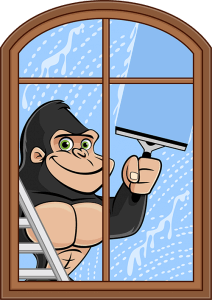 If streaks, spots and stains are blocking your view, call our Gorillas for your Milton window cleaning. More so than simply letting in a bit of daylight in, the windows around your property can have a much greater effect on your property than you might think. In a retail, or hospitality environment, having large, clean windows can create a welcoming environment for potential customers or guests. When inside your home, sunlight can affect your mood, as well as your bills. As windows begin to collect coatings of debris or dirt, it blocks out all the light and warmth that you might expect for your property. This can affect the outcome of your business day, as well as increasing the bills around your property. Heat and lighting don’t just grow on trees and in order to benefit the environment – and your wallet – it is important to keep your windows clean. Because windows are such an important part of your property, they require extra care and consideration. Trying to tackle your Milton window cleaning with the wrong tools will produce the wrong results. The friction that occurs from wiping glass side to side, creates a static charge that attracts new debris to surfaces. This means that your windows might look dirty within moments of being cleaned. Instead of wasting your time on a roundabout cleaning technique, call our Gorillas. Our expert Milton window cleaning techniques can prevent this static by using rubber tools. Instead of focusing only on the glass panes of your windows, our Gorillas cover sills and frames as well. 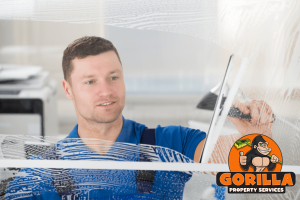 When you need to clean the windows around your residential or commercial property, all you have to do is pick up the phone to a Gorilla. Each of our Gorilla-Mobiles are equipped with a mobile water source, so there is no limit to where out services can go – up to four storeys, that is.